I shared our guest room/nursery's most recent updates here. I'm back today with another new feature in the room. Our house is circa 1953. Also the year my mom was born (sorry for the out, Mom!). So, naturally, she has some old features. The house that is, my Mom still looks good (wink). 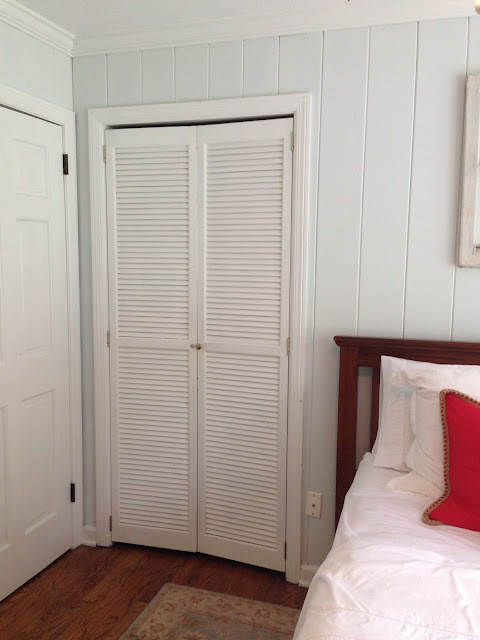 Would you believe our house in Atlanta had walk-in closets in EVERY bedroom? So, moving to this Savannah cottage has forced us to get creative (and donate lots). I've never liked the closet doors. They just feel totally dated (60+ years, to be exact) and well, cheap. The best advice I can give if you find yourself in a similar situation with a similar budget, embrace it. 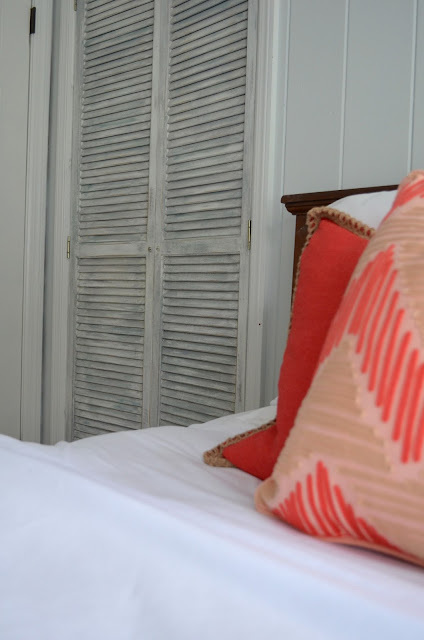 I'm a firm believer in mixing the old with the new in every room. By doing so you'll achieve a collected look rather than a catalog sterile feel. Whether it be mixing antique furniture with new accessories, new furniture with vintage oil paintings, or aged brass lamps with fresh funky patterned wallpaper, the balance of old and new is sure to give your space big personality and a timeless style. My plan of attack in embracing these old doors? Make them look even older. Chalk paint to the rescue. In order for the old doors to live in their skin, I wanted the old bumps and wrinkles to come through. Rather than leaving them stark white with a smooth surface, why not allow for them to be cracked and aging? Perfect way to bring in more texture to this space as well. I'll probably do more sanding and throw on another paint color in a few days once this dries completely. The colors are Annie Sloan duck egg blue and paris gray. Savannah locals, you can get all of your Annie Sloan products from Lily Bay downtown. They are very helpful and will guide you on your chalk paint journey. And one last after. A little paint and sand paper will get you places! Working with what you have does not always mean settling for less. 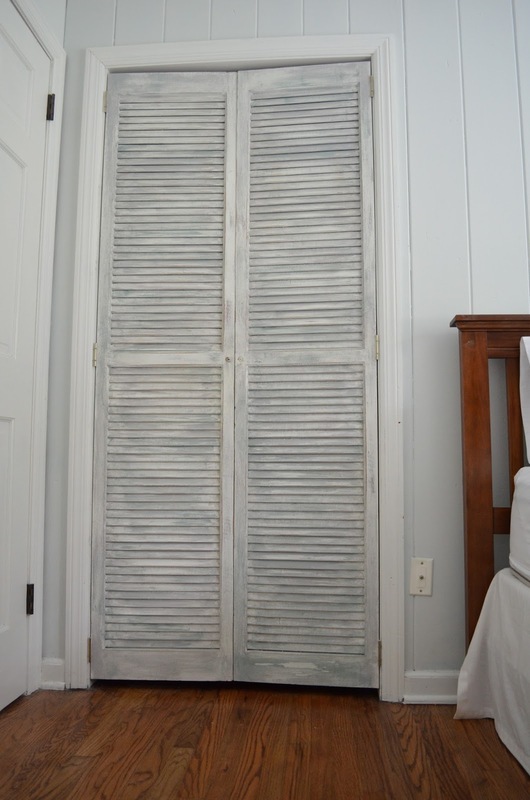 Have you embraced anything old in your home lately? 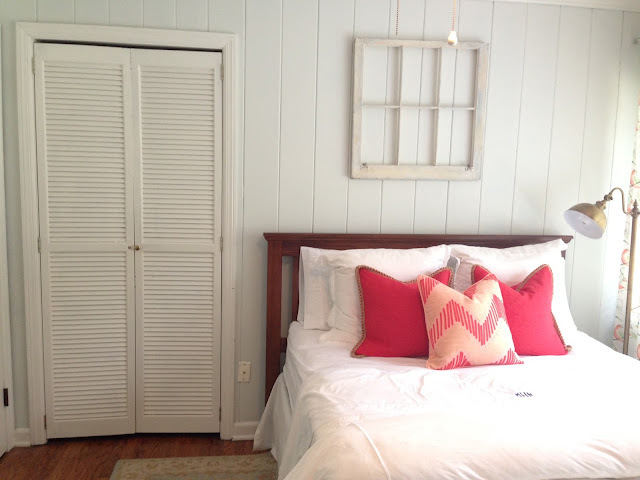 Linking to Savvy Southern Style for Kim's Wow Us Wednesdays party!